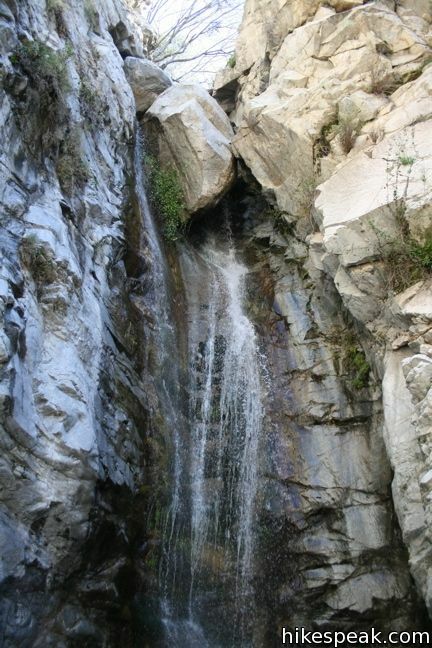 Millard Falls is just half a mile from the trailhead, up one of the most pleasant canyon in the San Gabriel Mountains. The 50-foot tall boulder-topped beauty makes a great destination for a short, sylvan hike. 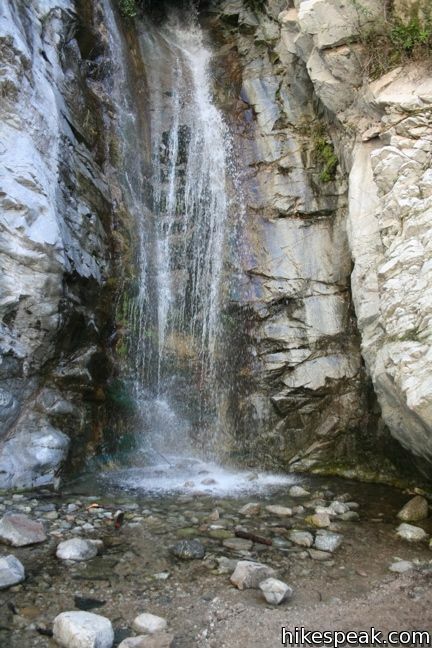 Millard Falls is one of the Los Angeles waterfall hikes. 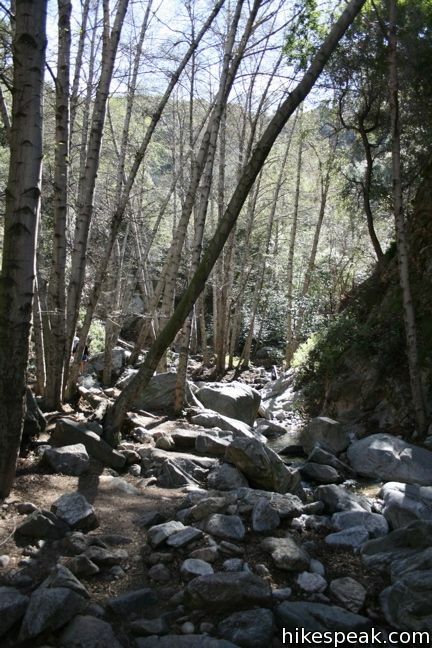 To see Millard Falls, embark up a dirt road through Millard Campground. Just beyond the campground, the trail up the canyon turns off to the right. 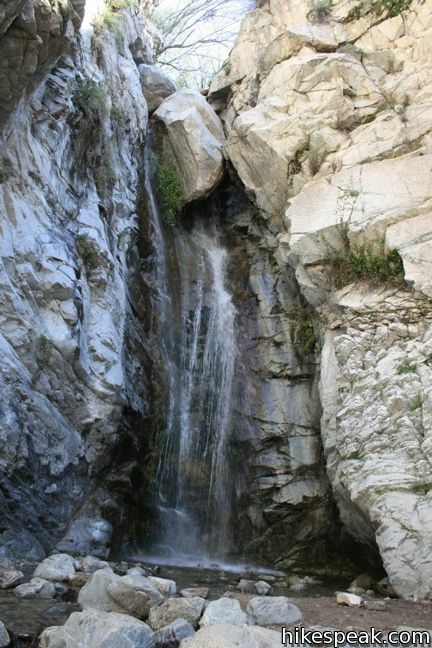 Millard Falls Trail is easy to spot, located along a creek that spills over the dirt road. If there is a strong flow of water, you are in luck; the falls above will be spectacular. If the water is so high that you would be afraid to cross the road in a sedan, use the same caution before heading to the falls (the trek may be wetter than you bargained for). On most days, you can make it to the falls with dry feet. 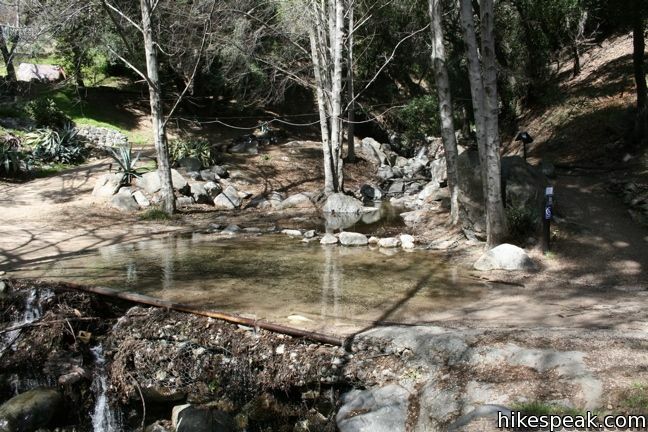 Then again, you will have to cross over several slippery rocks, so be careful. 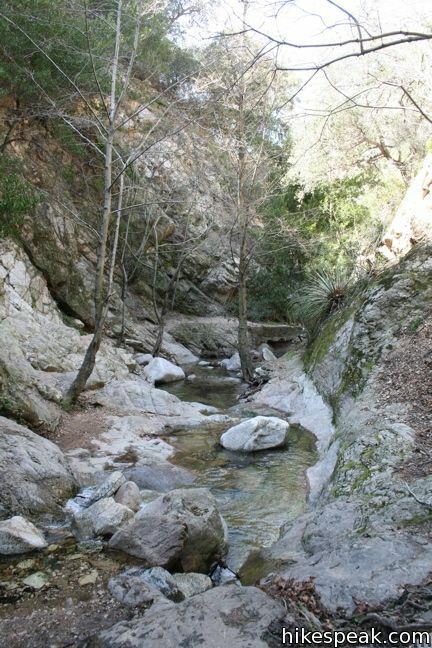 Millard Canyon is fairly narrow, measuring less than a hundred feet across in most areas. 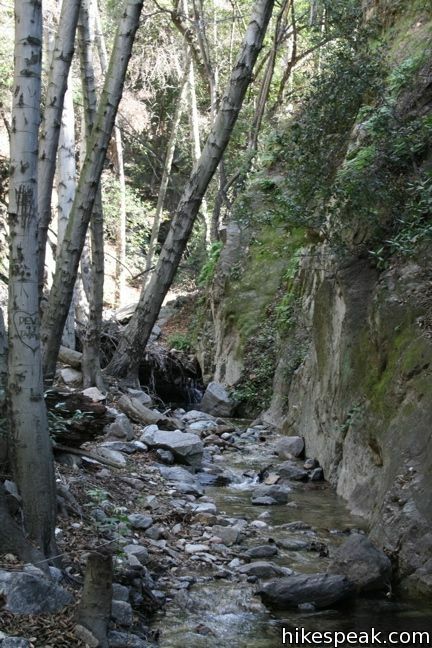 Getting to the waterfall requires numerous creek crossings as the trail searches for room up the canyon. Smooth-walking sections are interspersed between rock-hopping regions. Enjoy this calisthenics workout under the shade of tall California bays. The clear creek waters glisten in patches of sunlight, creating a serene ambiance. Even the ubiquitous carvings that desecrate most of the bays on the trail cannot detract from the splendor of the journey. Let the fresh air fill your lungs while the soothing water sings in your ears. The creek is a delight, and the falls are a tremendous sight. Keep to the canyon, and no matter your path, you will reach the falls. The boulders wedged atop this fifty-footer look like they could fall the next time the creek floods. They haven’t budged in years, and lets hope then never do. 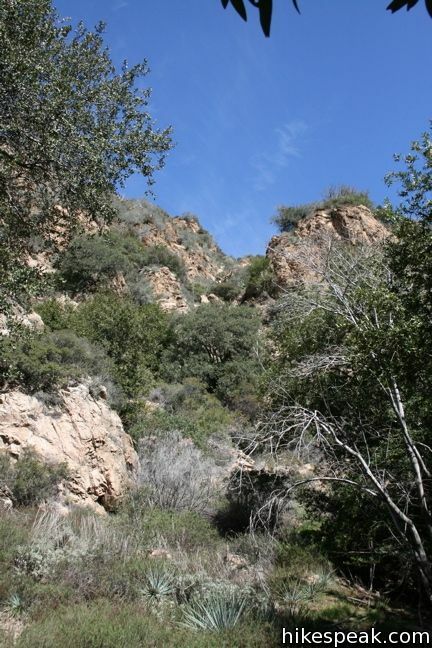 If the first half mile of canyon leaves you yearning for more, the hike can be extended. 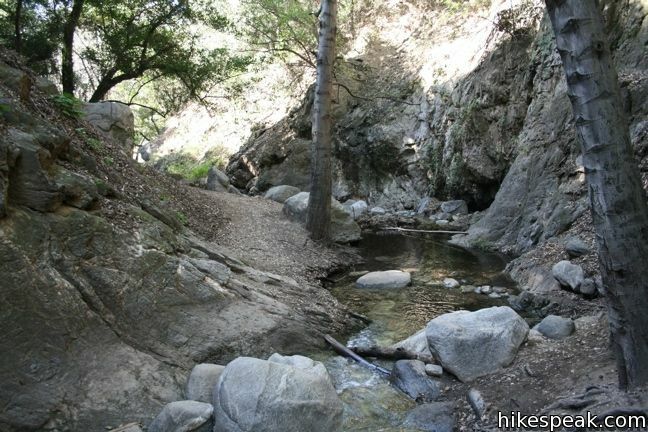 The trail continues above the falls to Dawn Mine, a great excursion. 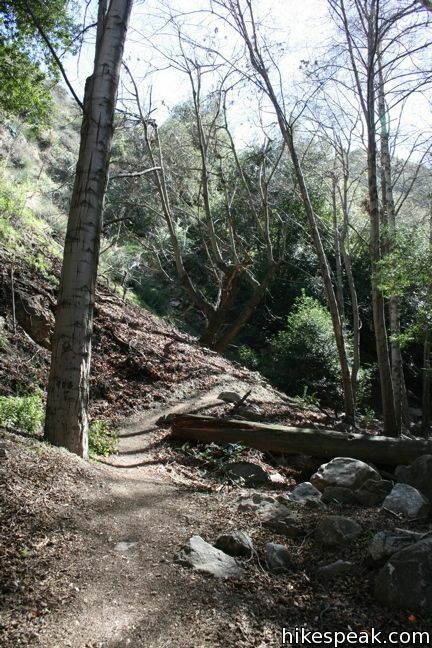 Half a mile before the Millard Falls Trailhead, Chaney Trail passes Mount Lowe Road, which can be used to connect to Sunset Ridge Trail to ascend to Cape of Good Hope or access Dawn Mine more easily. 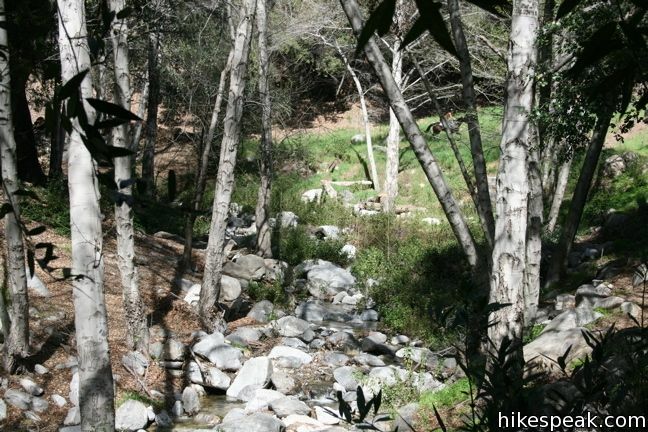 To get to the trailhead: Take the 210 Freeway to Pasadena. Exit Lake Avenue and head north. After 3.5 miles, turn left at the T onto Loma Alta Drive. After one mile, make a right on Chaney Trail. 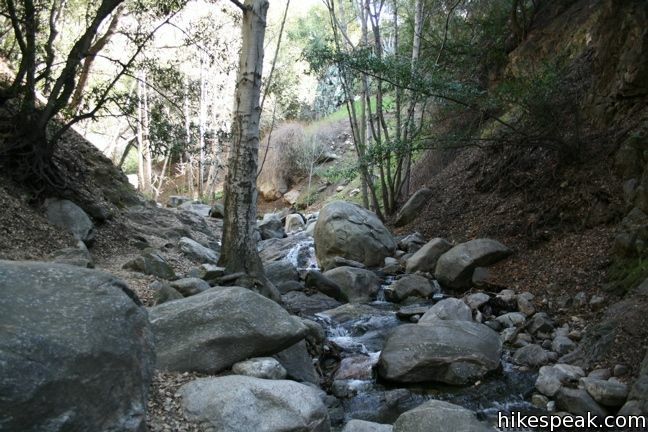 The 1.5 mile road winds up to Sunset Ridge and down to the parking lot for Millard Campground and the trail to Millard Falls. These photos were taken in March of 2009, prior to damage from the Station Fire. Click to enlarge. 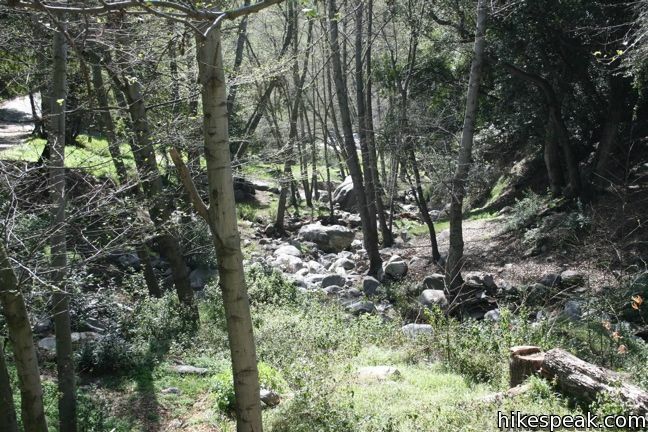 This 5.1-mile hike venturing up an canyon along the Arroyo Seco is one of a couple routes to a 5-site trail camp in Angeles National Forest. 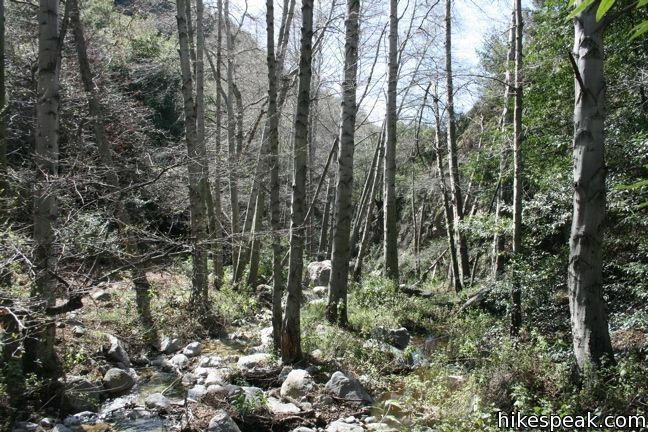 This is the place to camp at the base of the San Gabriel Mountains. 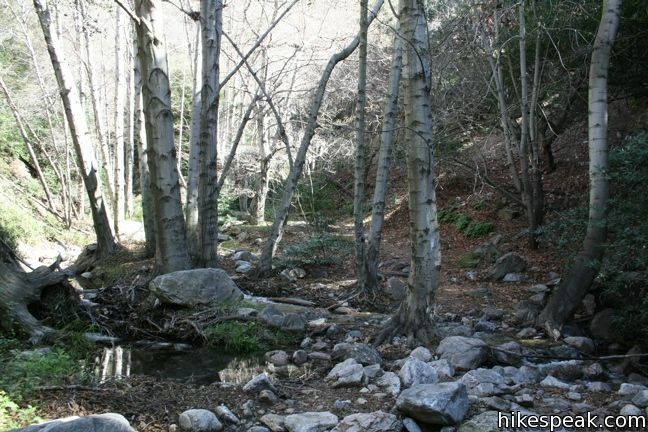 Or, the place to start on a hike to Millard Falls or Dawn Mine. Could you please tell me as soon as possible if this information on Millard Trail being closed is correct? 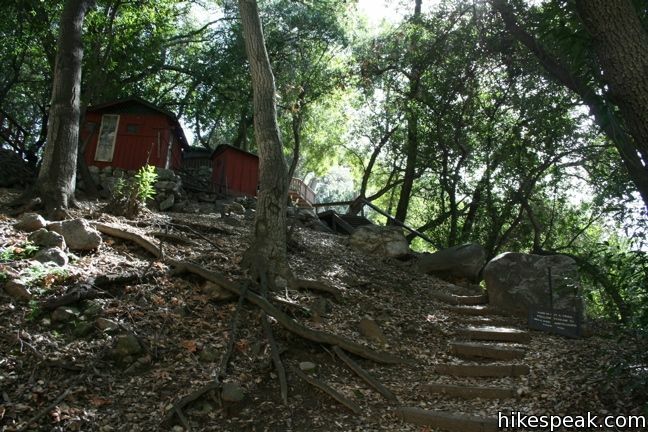 Plannning on taking a bunch of children on hike tomorrow July Tenth. Thankyou. Millard Canyon is still within the closure area of the Station Fire. You may call a ranger to confirm, but I believe it is still closed. Called to check 8/21/2012: Still Closed. as off sept 15 2012 , all of millard creek closed from millard campground all way past dawn gold mine . via taking sunset trail , once your in millard creek your in closure area also . dawn gold mine is also in closure area . 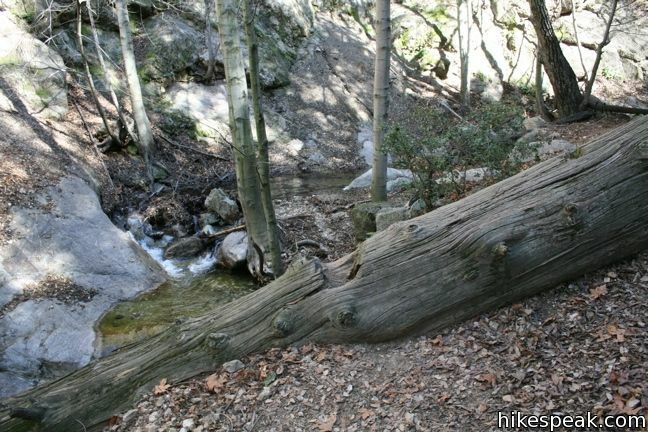 As of 01/02/13, Millard falls trail is closed to hiking. It’s cr#ppy that the forest service hasn’t posted a sign saying this at vehicle entrance or parking lot. So you most likely bought a day pass to park, unloaded your gear, started walking up the road (past Chester’s double wide) to the water line, and up to a fence with a sign saying “trail closed due to fire damage”. 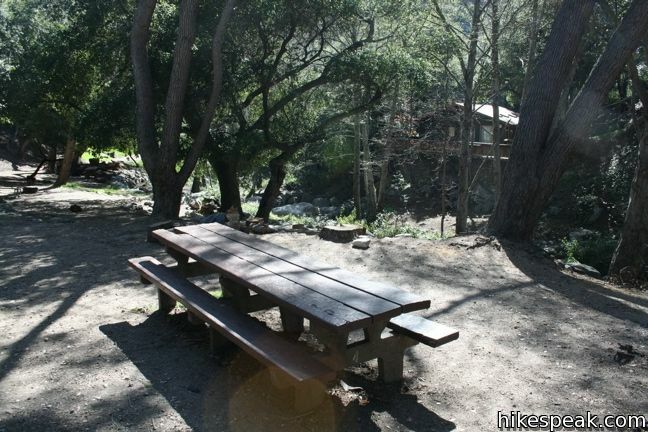 The tiny Camp/ picnic area (non-potable water) is available. Camping there isn’t great since it’s right along the trail that goes up to the fenced off area of the Fall’s trail. So you are going to get alot of people walking past you, looking at you, and asking YOU about why the trail is closed. There is a camp ground chester that lives onsite to monitor the parking lot and “other activities”. So don’t try to park in the parking lot without a day pass. He will ride his ten speed down in a blaze of glory to your spot and call a tow on your vehicle. BTW:It is a felony to punch him in the face, so don’t do it. He has direct comms with the Sheriff’s down the road. It isn’t worth ruining your weekend. Day passes can be bought at any ranger stations or Big 5, sports chalet, etc. for a couple bucks. The campsite chester can be identified by the double wide trailer located at the right of the trail, next to the camp site. He has a hidden video camera (hidden by a tarp or pieces of wood) that looks onto the camp site. Did I mention that the camp site is mainly used by cub scouts? Thanks to the park rangers for looking out for us. 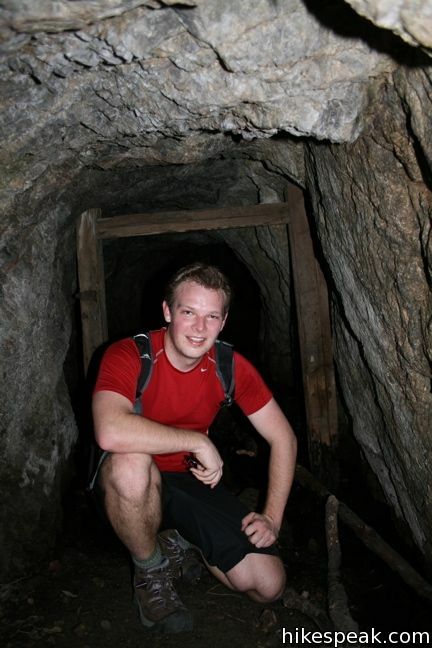 B Mac – I’m planning a scout camping trip to Millard. 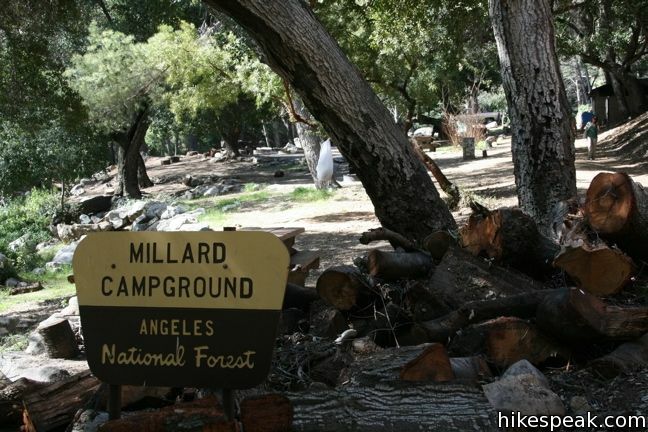 Is there any hiking available from Millard or are you pretty much trapped in confines of the camp? We just camped there and not a cub scout in sight Actually pretty quiet. The trails up to Mt. Lowe Road (Lower Sunset Ridge Trail) and beyond that up to the Saddle and Sunset Ridge Trail were all open. Lots of mountain bikers but they were all very respectful, carefull and polite. Every one said thank you when we stood aside. We camped and hiked mid week-though it was a Spring Break- and less than half the sites were occupied. It will probably be busier at weekends and now that it’s warmer. The high country sites were due to open April 1st. Sulphur Springs was supposed to be open year round but the roads were all closed even though it was dry as a bone and not a speck of snow so you can’t go by what it says on the Forest Service site as noted above. 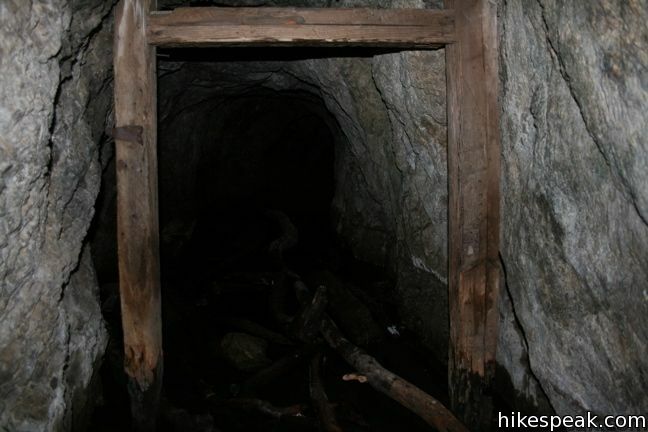 UPDATE Dawn Gold Mine and Millard Falls are still in the closure area – no hiking, etc. – update as of June 1st, 2013. Area will remain closed for up to 1 more year. 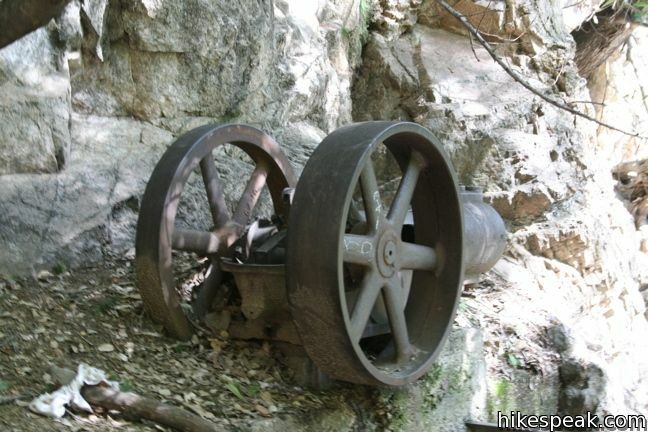 As of May 5, 2014, trail to Millard Falls and Dawn Mine still closed, 5 years after the Station Fire. I think this is disgraceful. Somebody should force the issue. 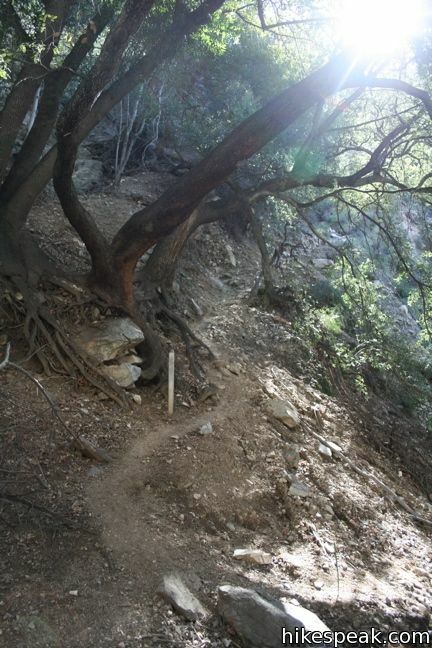 Any update on the re-opening of the trail? 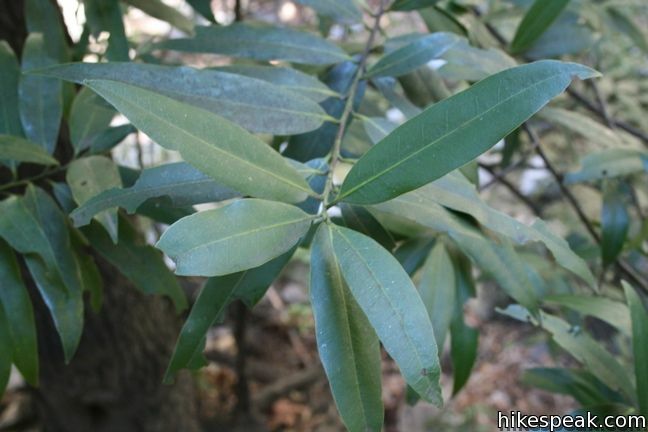 This is a great time of the year for hiking…let’s get it open! 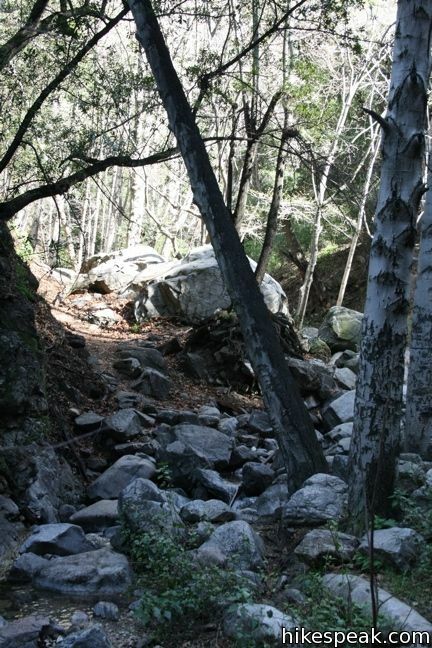 Is the trail to Millard Falls reopened yet ? 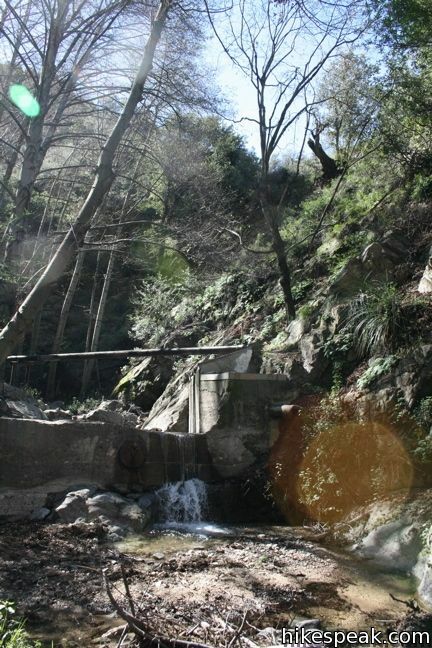 Is Millard Falls reopened now ? Yes. 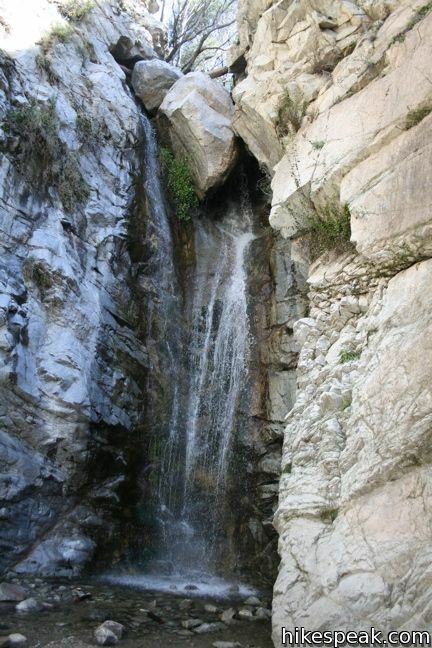 Millard Canyon has reopened and the waterfall is flowing! Is the waterfall still flowing now in Augest??? We enjoy hiking Millard falls the most. Beautiful tall waterfall with decent amount of water (5/27/17). SAT was crowded @7am but SUN @6am was empty. 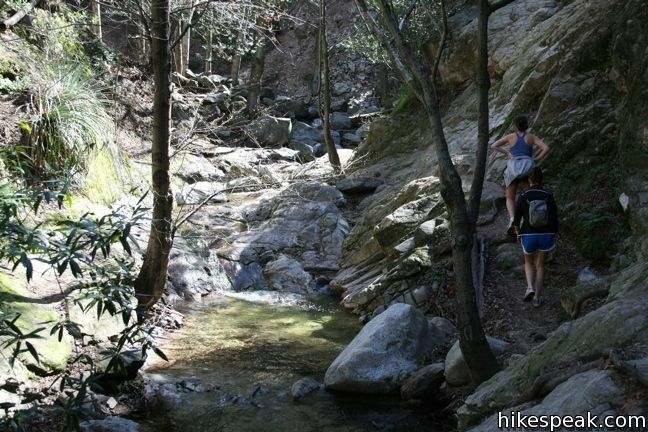 Hike has plenty of beautiful scenery to enjoy along the way especially creek crossings. Any recent visitors that can update the waterfall. Does anyone know if the Millard Falls are open now and if there is water? I plan to go this week, probably 7/5/18. 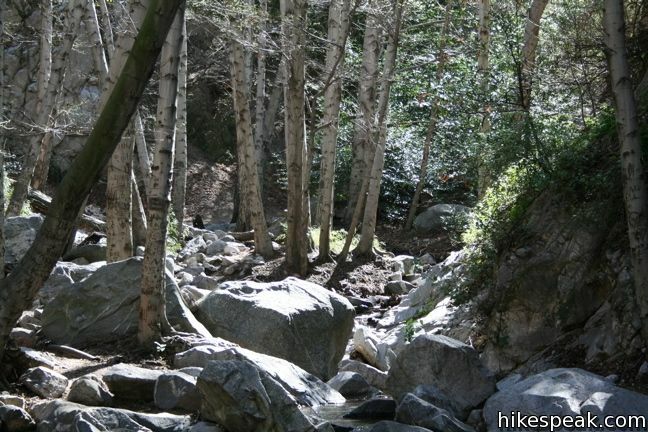 I’ve hiked many times in Malibu, above Pasadena, near JPL, etc. I’ve NEVER needed a day pass. 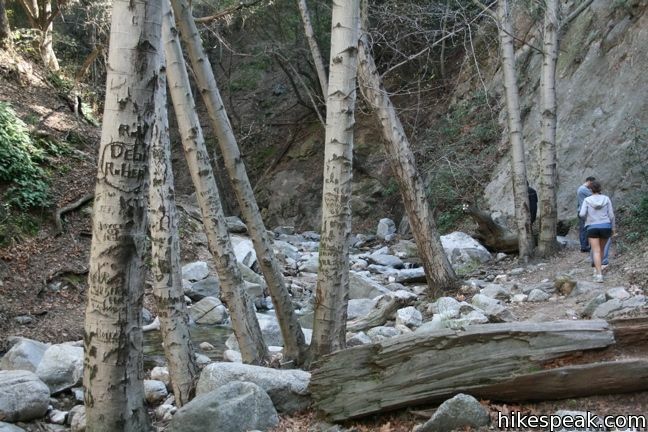 Why is it stated (in Hikespeak re waterfalls near LA) that we need a day pass to go to Millard Falls? 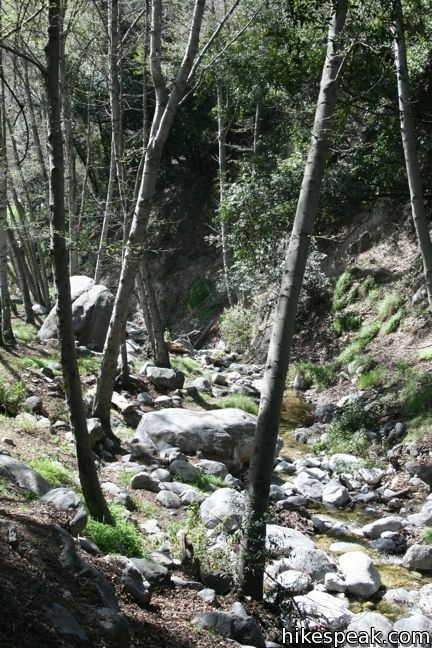 Angeles National Forest relies on funding from the National Forest Adventure Pass as well as the annual “interagency pass” that’s also used at national parks.